Electrospray is defined as a technique that allows to obtain nanodroplets and nanoparticles, using for this purpose an electrified liquid based solution. It shares characteristics of electrospinning process and other conventional spinning processes although coagulation bath and high temperatures are not required. This issue makes the electrospray process suites to the production of micro and nanoparticles using polymers with short-chain molecules. When a high voltaje HV is applied to a liquid meniscus that pokes out from the tip of a capillary tube, the liquid becomes charged and is produced a balance of forces between electrical repulsion and the surface tension of the liquid. As a consequence, the meniscus is stretched and the spherical shape of the liquid turns into a cone, called Taylor cone in honor of G.I.Taylor, who was the first who described the conical geometry. From the tip of the cone, a thin jet is emitted. Due to varicose efforts, the jet should break up in a cloud made of infinite droplets. The free charges within the liquid are directed towards the surface of the liquid and turns the spherical meniscus at the end of the capillary into a cone (Taylor cone). The apex of this cone emits a microscopic liquid filament (jet), which breaks into droplets due to capillary efforts. This electrospray operating mode was referred to as “Cone-Jet” by Cloupeau and Prunet-Foch (1994) to differentiate it from other modes of breakage that may present a liquid meniscus within an electric field. The jet breaks into charged droplets because of varicose instabilities (as an aerosol). Electrical forces of repulsion, which appears between the droplets, results to a perpendiculary displacement to the main movement in direction to the collector and leads to the formation of a conical cloud of droplets. If a polymeric solution is processed by electrospray, micro and nanoparticles can be produced thanks to evaporation of the solvent. Controlling solution parameters and the flow rate, a certain diameter size can be obtained. The discovery of the electrospray process is not recent. Around the year 1600, in the William Gilbert´s “De Magnete” work, it was said that a drop on a dry surface was deformed by a piece of amber located at a certain distance. Amber pulled towards him from the nearest drop, taking it a conical shape. In the eighteenth century Bose became awared of this phenomenon, using a glass capillary through which a liquid was injected, and connected to a high electrical potential. However, it has not been possible until later to develop a theoretical model which explains the phenomenon of electrodynamic spraying. The electrospray process was studied first by Zeleny in 1914. 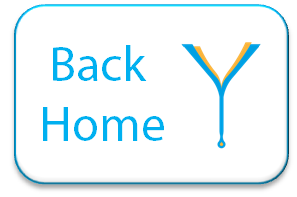 Later, in 1964, Taylor was the first to give a mathematical basis to the conical shape which adopted the meniscus. Today, countless studies has been performed, both theoretical (see Fernandez de la Mora 1992, Hartman 1999), and theoretical-experimental (ie Gañán-Calvo et al. 1997, Fernandez de la Mora and Loscertales 1994), which favors a better understanding of this technique. Electro-Hydrodynamic atomization (EHD) in their mode “cone-jet” has been described as a succession of three processes: The first is the acceleration of the fluid inside the cone. The shape of the meniscus is a result of the balance of forces between the liquid surface tension, gravity, electrical stresses at the surface, inertial and viscous stresses. After a transition to the cone-jet mode it is reached the second process: breaking the jet into droplets, which is dominated by capillary efforts, in addition to normal and tangential forces of an electrical nature. Finally, the third process is the development of droplets along the spray. The droplets repel each other due to the high charge they possess. The smallest droplets stand outside the spray, and the heaviest ones stand on the central axis. Many studies demonstrate that two main parameters characterize the process perfectly, one of electric type, which is the electric current “I”, and another which is the diameter of the droplets of spray. The diameter “Dd” of these spray droplets, which exhibits high monodispersity of sizes, can range from hundreds of microns to tens of nanometers. The droplet size and the intensity can be controlled by the circulating flow and the fluid properties: electrical conductivity, surface tension, viscosity, density and dielectric permittivity. In first approximation, the conductivity can vary the order of magnitude of the diameter of the droplets. The flow can move in a range of sizes greater or lesser degree, once fixed the liquid conductivity. The other properties of the fluid have a much lower relevance determining “Ddroplet” and “I”. It is important to mean that within a particular range of values ​​of the applied voltage V, regardless of electrode geometry, it is shown that the two main variables which characterize the electrospray remain virtually unchanged. Also noteworthy is the ease with which one can control the droplet size. By contrast, the disadvantage of this technique, it must be said that the flow rates with which they work are very low, since nl/h until ml/h, leading to a low production of particle mass in comparison with other techniques used in industries at present. The importance of the flow rate and the electrical conductivity when determining the drop size is resumed is resumed in the scaling laws. 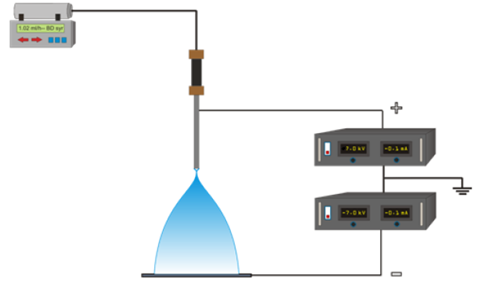 Cone-jet mode can be obtained in a wide range of electrical conductivities, which enables the production of aerosols with a wide range of droplet size. Possible shapes of the meniscus in the cone-jet mode. Courtesy of M. Cloupeau. Cone-jet mode pulsed or intermittent. Is observed when the voltage or the flow supplied are slightly lower than those needed to achieve a stable cone-jet. The jet is emitted intermittently and alternately meniscus tip taper to a rounded shape with a very high frequency, so that changing a rounded cone may be imperceptible. The jet diameter varies during the different phases of issue thereof, and that, consequently, the distribution of droplet sizes is never monodisperse. Multijet mode or multi-cone-jet. Adjusting the voltage at point necessary is obtained cone-jet mode. If you increase the voltage, the vertex from which the jet issues can be divided into two points that emit a jet each. As the voltage increases may appear more emission points. Multijet mode makes it possible to simultaneously obtain a large number of jets, and to increase the flow rate consequently. 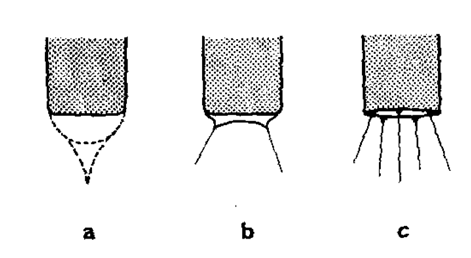 Variations of the cone-jet mode: a) cone-jet pulsed, b) and c) multijet. Courtesy of M. Cloupeau. – Energy saving: No need for a freezing chamber (Spray Chilling) or drying (Spray Drying) or a chemical reactor to solidify the nanoparticles. – High monodispersity of primary droplets. Inexistence of satellite droplets. It is ensured a low dispersion of the size of nanoparticles. There are two variables that allowed us to characterize an electrospray in a steady cone-jet mode, which is the intensity “I” and the droplet diameter “dg”. These two variables depend largely on the electrical conductivity “K” and the flow rate “Q”. In addition they also depend (smoothly) on other parameters such as the viscosity “μ”, the relative permittivity “ε”, density “ρ”, and surface tension “γ”. There are a some of expressions that connect all these variables, and whose objective is to characterize this process, which are called “Scaling laws”. It has to be emphasized that the geometry parameters of the electrode used and the applied voltage do not appear in formulas, and this is because both “I” and “dg” are practically independent from the same, once it reaches the steady cone-jet mode. dimensionless viscosity, ε0 the vacuum permittivity, b1 and b2 are two functions of the relative permittivity of the liquid and c1 is a constant. The standard laboratory setup for electrospinning consists of a spinneret (a needle or a hole) connected to a HV-DC power supply, a syringe pump, and a grounded collector separated from the spinneret a few centimeters. Emulsions, nanoparticle suspension, polymeric or sol-gel solution can be processed by electrospray. The liquid is placed into the syringe located in the syringe pump, which pumps the liquid to the tip of the spinneret, where is extruded at a continuous flow rate pump. This condition (constant flow rate) can be replaced by constant pressure condition using a header tank (for feeding), which is highly recommended if a high conducting liquid is devoted to be electrospinned. Yflow® Multiplexed Nozzle Technology enables to increase the througput of the electrospray process.